New stamps in 2016 will include the planets, Star Trek and NASA. Trekkies rejoice. The United States Postal Service unveiled its 2016 line-up of stamps on Wednesday. A highlight of the group is a set of four Star Trek stamps honoring the original TV show's 50th anniversary. The Star Trek stamps show classic icons from the original series on a background of stars. There's the USS Enterprise, the Starfleet insignia, a crew member being beamed up, and a Vulcan salute. Another cult favorite to get its own stamp this year is Pluto. One stamp shows the newly photographed dwarf planet. Another stamp is of its own personal paparazzo, NASA's New Horizon spacecraft. 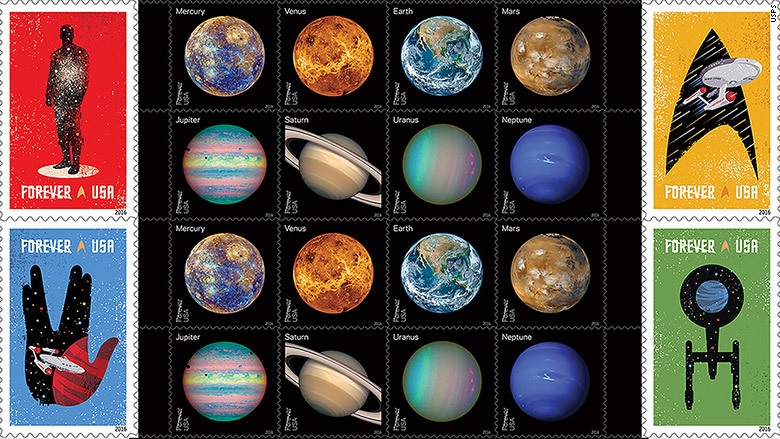 To avoid any hurt feelings, there are also colorful stamps for all eight planets. Other stamps honor teacher Jamie Escalante made famous by the movie "Stand and Deliver," civil rights activist Richard Allen, and Shirley Temple. 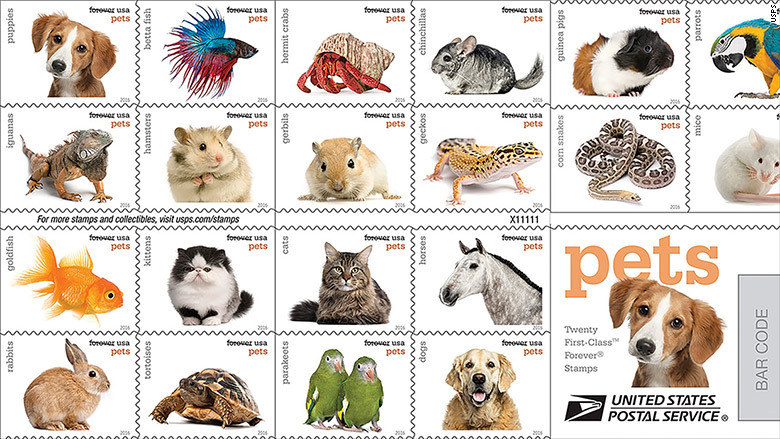 There is also a delightful book of stamps devoted to pets. There are 20 critters, including cats, fish, a bunny, and a hermit crab. The USPS issued Star Trek stamps once before in 1999. This year's stamps were created by design firm The Heads of State. "We aren't Trekkies but we love the franchise, especially the tone and aesthetic of the original CBS series," said Jason Kernevich, creative director of The Heads of State. "As we were working on the art Leonard Nimoy passed, so that created an even stronger connection to the material for us."